Back in 2010, it looks like you planned on adding a Calendar link and a Time line view (see attached). IS there any possibility you are going to do this or no? It would be so useful to be able to set start\end\due dates and have them map into google cal for example. As a matter of fact, are you removing functionality? I thought when I first tested GS the it had a START and END date available. Now there is only a DUE date. Thanks for your inquiry – good to hear from you again! We implemented the Timeline/Gantt View in our corporate product Goalscape Enterprise. We are still considering rolling this out (along with some other 'business' features) in a new 'Goalscape Plus' product (to be available as an upgrade); we cannot however indicate any delivery date for this. We are also still looking at calendar integration; again though we cannot indicate any delivery date. Displaying Start and Due Dates in the panel is now optional – there is an option for this in Settings (click the 'cog' button at top right to open the Settings screen) – see the attached screenshot. 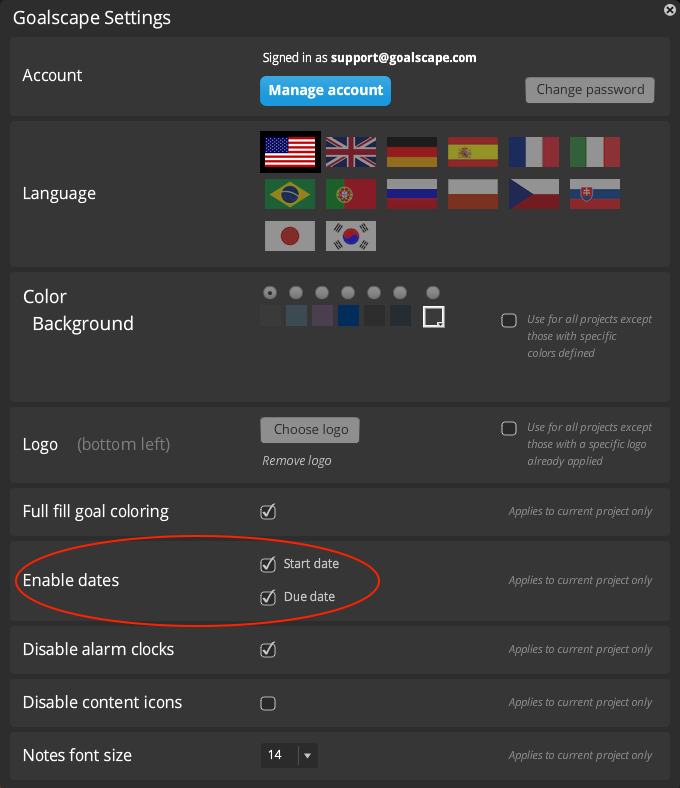 Where you have set dates in a project, their display is enforced; so if you are not seeing any Start dates you may not have set in that project (although you have set Due dates). thanks for the fast update as always. I think the Calendar integration would GREATLY enhance the appeal of this as a project management product. Hope it comes soon. Our company uses Google Calendar so all our teams can see whats what, So removing this need for double input would be. You can already implement a partial integration with Google Calendar: for the Due Dates for significant goals you can create corresponding Events in Calendar (using the notification options). Since every goal in a Goalscape Online project has its own URL, you can use hyperlinks in the Event Notes that take you straight to the relevant goal(s). You may also be interested in Emmett Lazich's blog article Getting Things Done – with or without Dates.